We are familiar with the role of our Society’s namesake in the development of hypnosis: this great little book sets out the background to and inspiration for his experiments and theories. 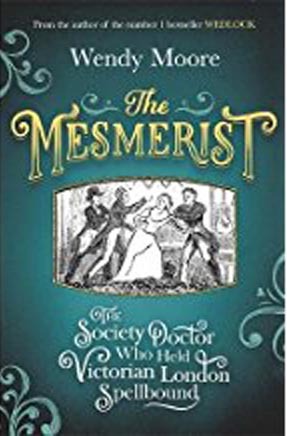 This is the story of a driven, principled and philanthropic man and the friends and enemies he made as he created a truly amazing interest in the practice of mesmerism. And not only in London High Society. When Victoria came to the throne medical treatment was unregulated, barbaric, and not in the least scientific. Medicines were few, and toxic or useless (possibly both) and secondary to bloodletting in the physicians’ armoury. The essence of surgery was speed, certainly not hygiene, and pain was valued as indicative of the patient’s life-force. Operations were on the kitchen table if you could pay, or in a hospital if you were poor. Onto this scene came two men central to this story who fought for medical improvement but ended on opposite sides: John Elliotson (1791-1868) the Mesmerist who built a lucrative private practice but also largely created University College Hospital and later the London Mesmeric Infirmary and got a Royal Charter for the precursor to the Royal Society of Medicine, and Thomas Wakely (1795- 1862) ex-surgeon, ex-alehouse pugilist, founder editor of The Lancet, and later, MP and Coroner. Elliotson did much to improve medical practice. He promoted the use of iodine for goitre, the use of the stethoscope and the thermometer, identified the cause of Hay Fever, and demonstrated the value of quinine for malaria and was “the greatest clinical teacher of his time”. This charismatic man threw his weight behind mesmerism and in spite of opposition from the medical establishment and mockery in the press established it as a valuable treatment for intractable medical problems. His undoing was his obsession with the more arcane mesmeric phenomena reported from the Continent and his failure to apply the scientific principles he had espoused. He might have been saved by James Braid who in Manchester had developed a more rational approach. But he rejected Braid’s ideas, having tried and failed to induce trance with his method. Chemical anaesthesia put the medics back in charge, and they soon dropped ‘pain is good’. It may not have been as safe as mesmerism even as practised by someone with no training such as James Esdaile (1808-1859) in India but it was convenient and it got Royal approval. With hindsight we can see missed opportunities for a wider recognition of the value of hypnosis. Oh, what might have been!